Seventy-one year-old Stella Goldschlag is nervously anticipating the arrival of a visitor. It is 7am and he is expected in just under four hours. Her anxiety stems from her past as a Nazi collaborator, where in order to save herself from the horrors of Auschwitz, agreed to inform on other Jews in hiding to the Gestapo. Presented by Strange Duck Productions, Blonde Poison, is the intriguing yet disturbing true story of Stella and the cost of her survival. 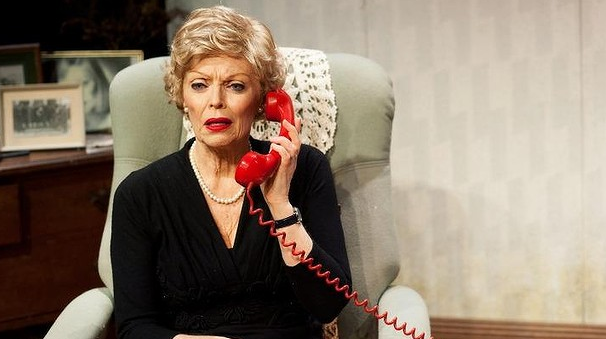 Belinda Giblin as Stella is an example of when casting is perfection. The accent is flawless, even when Stella's emotions sometimes get the better of her as she recalls the more horrific moments of her life. The poignant facial expressions and wide eyes made up with black eyeliner are still printed firmly inside my mind. You can't help but sympathise with Stella but at the same time, she is responsible for the death of thousands of Jews. Giblin's portrayal of the desperation and defeat enveloping Stella in the final moments of the show are powerful and conflicting that leave you wondering if Stella has managed to manipulate yet again. It truly is an amazing performance. Jennifer Hagan's careful direction shows Stella's gradual unraveling, as it becomes clear that she is slowly losing herself to the horrors of her past; lamps are turned on despite it being morning and picture frames are placed backwards on coffee tables. The story itself, written Gail Louw, does lose its momentum at times, but Hagan and Giblin work hard at overcoming this with that masterful finale. The set design by Derrick Cox is well thought-out and subtly links in with Stella's life and ideas raised in Blonde Poison. The full-length mirror that Stella occasionally looks into and speaks to visually reproduces her inner self- reflection and her external confessional for her, and the suitcase full of dolls is a constant reminder of not only Stella's own child, but also the naivety and innocence Stella had when was doing what she was doing to stay alive. Jeremy Silver's hauntingly captivating score is paired well with Matthew Tunchon's adroit lighting design, both which build on the intensity during Stella's interrogation scenes. Blonde Poison's overarching idea - what would you have done? - is a difficult demand to answer and fortunately, one that we are unlikely to ever face. While it's easy initially to condemn Stella Goldschlag for these crimes, the growing impact of her protestations of innocence are difficult to ignore. Blonde Poison is a thought-provoking production that is relentless and powerful in its execution. *Original review appeared on Theatre Press on 5 June 2016.